Growing up in an Chinese family, we’ve never prepared for Santa’s big arrival every year. Not until moving to Canada that I learned about Santa, cookies, milk, gifts, and chimneys. Well, there’s a first time for everything, right? Baking can sometimes be therapeutic, just need to enjoy the process and its delicious outcome. When I feel the need to step away and bake, I usually turn to good cookie recipe because it is easy to make, and I know they will turn out. 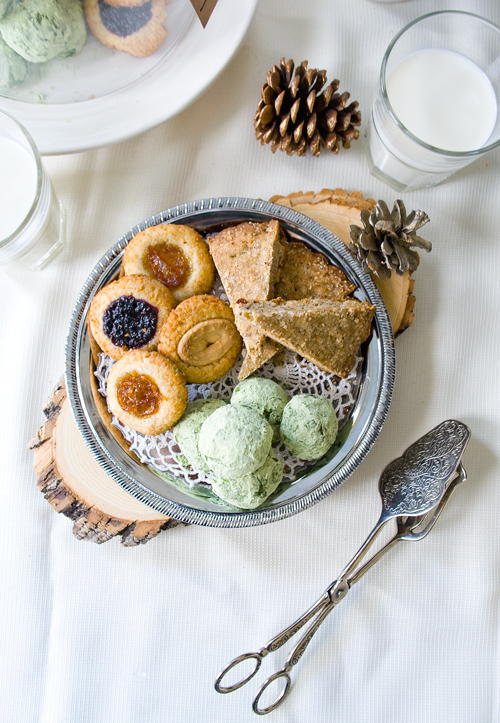 So this year I have Cookies for Santa – one recipe, three ways! These variations are based on one basic cookie dough and just by adding some flair, they become deliciously different. You can create your very own versions depending on your preference – a clever way to save time during this busy season. In a stand mixer bowl, with a paddle attachment (or use an electric mixer) beat butter and sugar on medium speed until light and fluffy, about 3 minutes, add vanilla extract to incorporate. Add flour and salt, mix on low speed only until a dough starts to form, stop mixer, scrape bowl. Divide the dough in half. Roll one half into a 12 inch rope, divide into 1 inch pieces. Roll each piece into a round ball with your palms. Continue with the rest of the dough. Place cookies evenly spaced in cookie sheet. Bake for 10-15 minutes, rotating halfway, until the edges turn slightly golden brown. 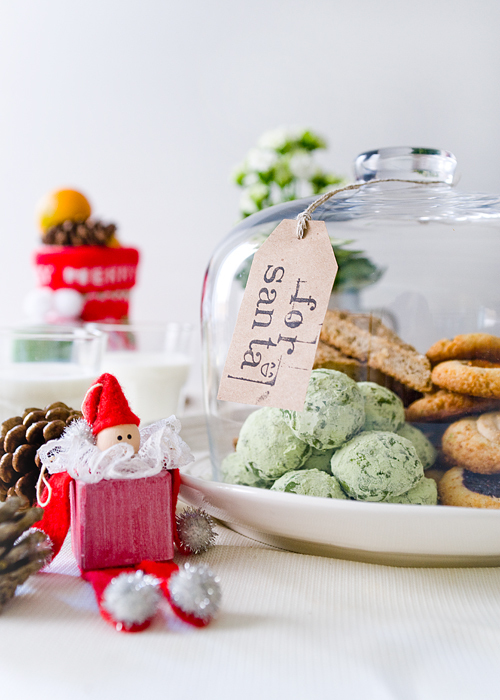 While baking, prepare the dusting mixture - sift icing sugar and matcha powder into a medium mixing bowl. After the cookies have come out of the oven, cool them for 5 minutes, and coat them in the dusting mixture, working 3-4 pieces at a time. Cool on cooling rack. When they have completely cooled, dust them again in the mixture to ensure a nice and even coating. Turn dough into the tart pan or cake pan with a removable bottom, pat down dough so it is leveled to the edges. Prick the dough all over with a fork. Sprinkle sugar evenly onto the surface. Bake for 30-35 minutes, until the edges are golden brown, rotating halfway through. Cool completely. Carefully cut into 12 wedges with a serrated knife. Divide dough evenly into quarters, divide each quarter into 4 balls, roll in shredded coconut. Place onto cookie sheet, make an indentation onto each cookie. If you are making ones with white chocolate, gently press a piece of white chocolate into the center, and bake for 20-22 minutes, rotating pan halfway, until lightly brown. If making jam thumbprints, bake cookies for 10 minutes, take out, gently reshape the center cavity with a spoon, fill with about 1/2 teaspoon of jam. Return to oven to bake for 10-12 more minutes until lightly brown. 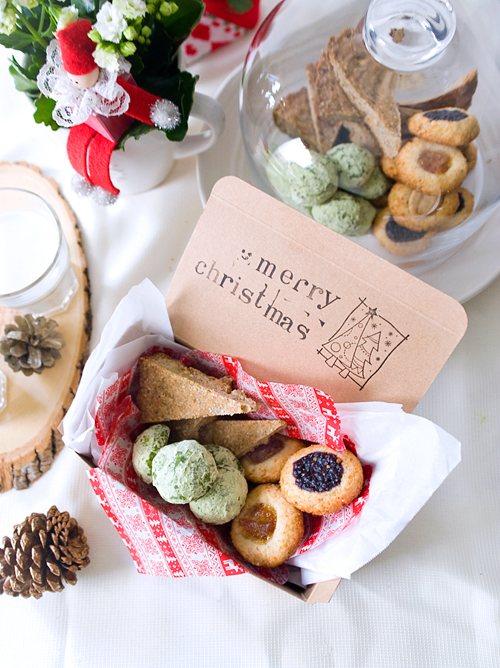 These cookies make terrific gifts, and with a little packaging, your friends and family will adore you. I try to give my close friends and family edible gifts every holiday because it creates less waste, and it saves me time from gift shopping, and the energy to think about what to give everyone. Instead, I just bake a whole bunch of things and give them away. These little gems can sometimes make people happier than purchased gifts! Happy baking! Have a wonderful and safe holiday!